Alright then prisoner. Now that you know how to get into a match of Jailbreak we'll walk you through all of the in-game elements, beginning with the heads-up display, or HUD for short. The top part of the Jailbreak HUD is the stance bar. It controls the aggressiveness of the bots. The higher the stance bar is the more aggressive the bots on your team are. If the stance setting is higher your bots will attack the enemy base and try to free your team. On the other hand, if the stance setting is low your bots will defend your base. You can control the stance setting using the keys assigned in the Jailbreak Preferences dialog. The compass can point toward one of two things: your release mechanism or the enemy release mechanism. If the color of the compass is red then it will point to the red release mechanism and vice versa with blue. You can change the compass' objective using the key assigned in the Jailbreak Preferences dialog. The compass can also be changed visually by switching the user interface skin, also available in the preferences dialog. Got cheese? The blue team information box contains the blue team's current number of captures (or their score) as well as a record of how many players out of the entire team are in prison. In the example to the left the blue team has no points and three of the five blue players are in prison. The red team information box contains the red team's current number of captures (or their score) as well as a record of how many players out of the entire team are in prison. In the example to the left the red team has no points and one of the five red players is in prison. What are the objectives in a game of Jailbreak? This section is critical if you're new to combat in Jailbreak. While releasing your team and fragging your enemies are both important, the most important part of Jailbreak could be defending your release switch. The release switch in your base will free all of the enemy prisoners you have captured, so if anyone form the opposing team gets to it and activates it, you'll have to frag all their released teammates again, and of course there is a chance that they might frag and capture you first. 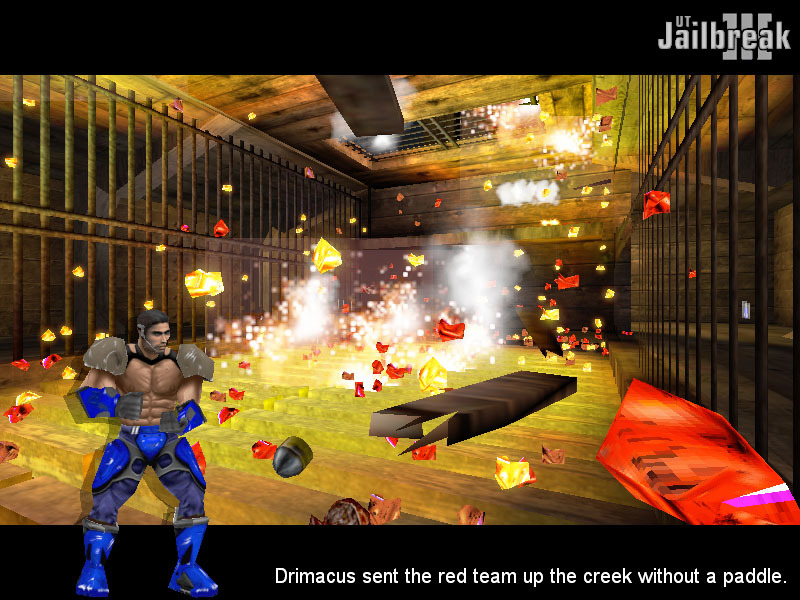 The objective of Jailbreak is to frag the entire enemy team sending them to jail and score a point for your team. If you have all but one their players in jail and the last enemy player activates your release switch, all the captured players on the other team will be released from jail, and you'll be back where you started. That is why defending your release switch is extremely important. It helps to have good teamwork and designate defensive positions to certain players. A good defense can win a game of Jailbreak sometimes, so make sure players are defending your release switch while the rest of the team goes out to capture the enemy. Otherwise it might be you getting sent up the creek without a paddle! You can't win if your teammates are all in jail. (well you could but it would be very hard!) An important aspect of Jailbreak is releasing your teammates from the enemy jail. Sure, the point of the mod is to frag the other team and defend your release switch, but you still have to free your mates from jail, right? Releasing your team can require planning and good team communication. If you just barge into the enemy's base you'll most likely be fragged and sent to prison. Some bases have back ways in, so you might want to try using those. And like a good team oriented mod, it's usually smart to take a band of teammates with you when you set out to release your team, as the enemy will usually be guarding their release switch. Don't wait to long to attempt to spring your teammates from prison. You may find yourself the last player on your team and that's a kind of solitary you don't want to try too often. Release switches come in all sizes, shapes and colors (though they are often the same color as your team, but not always!). Don't forget to use the release locator arrow to help you find the release switch since some aren't as obvious as others. I think you already know how to frag, don't you prisoner? If you missed that meeting, it's pretty simple. Frag all the enemy players and send them to jail. When this happens your team will score a point. Got it? Good! Sometimes even a prisoner like you gets lucky. You already know how to frag, so this one is pretty easy too. On occasion while imprisoned you may be sent to and arena along with an enemy prisoner to fight for your freedom. When you are sent to the arena with an enemy, frag them! Got it? Good! Arena matches tend to go fairly quickly, so be prepared. If you succeed in defeating your opponent you'll be freed from prison and respawned back into the map. If you get fragged then it's back to jail with your loser behind. Every arena is different and they are usually small. Take in your surroundings quickly, grab a weapon if there are any, then go frag the enemy. Statistics tracking is a new feature in Jailbreak III. If you have set your Jailbreak Stats Password in the Jailbreak Preferences dialog, the server will keep a record of your frags when you play online, deaths, team releases, and many more unique stats during each game. In addition, your stats will be sent to a central Jailbreak World Stats server. You can view your world stats record either on the Jailbreak World Stats website together with the stats of many other players or via the Show Stats button in the Player tab of the Jailbreak Preferences dialog. Scoring is the only way to win in this game prisoner so make sure you know how the scoring works before heading out into battle. The scoring criteria is as follows. As a team, you score one team point for every time the enemy team is captured. The scoreboard is another key part of each Jailbreak match. It will let you know where the players on your team are, how many points each of them have, how many players on the opposing team are in jail, as well as many more statistics on the current game. Following are some key parts of the scoreboard. The scoreboard has a separate section for each player in the current match. Below is the stats for one player in a game of Jailbreak. A picture of the face of the model that the player is currently using is shown in spot 1, or an icon telling you whether this player is in jail or in the arena. The player's name is shown is spot 2. Spot 3 shows your current ranking on this game server if you have your Jailbreak Stats Password set in the Jailbreak Preferences dialog. The small colored vertical bar next to it shows your ping in network games; small and green means you have a good/low ping, a big and red bar means your ping is bad/high. The current number of points that the player has is show in spot 5. With this version of Jailbreak you can no longer translocate wherever you want whenever you want. Now, translocatable zones have been introduced. To put it simply, you may only use your translocator while in one of these zones. If you're not in one of these zones a small icon will be displayed in the bottom right corner of your screen, underneath the HUD (shown below). Also, if you fire your translocator and try to alt-fire to translocate to where the disc landed a large icon will pop up in the middle of your screen and eventually fade out (show below). Many of the maps released with Jailbreak make use of translocatable zones, but some user-made maps may not. If a map contains no translocatable zones you won't be able to use your translocator anywhere in the map. In Jailbreak you can make human ladders. These are most useful in prison when trying to access an escape route. (Yes, some prisons have secret escape routes!) How do you do it? You can jump on top of another player (helps if they crouch/duck) to create a two-person ladder. Then the person you're standing on can jump on top of another player (helps if they crouch/duck) to create a three-person ladder, and so on. The main use is of a human ladder is to get to escape routes in jails, as mentioned above. If the entrance to an escape route is too high to jump into then you must simply get another player to stand under the jail while you jump on top of them and crawl into the escape route. Shhhh... be very quiet while escaping! Jailbreak has full bot support. They will know how to defend your base as well as release your team. They also know how to battle in the arena. In this version of Jailbreak custom models are also fully supported. A cool feature in the Jailbreak bots is that you can adjust their aggressiveness. If it's high, they will head straight for the enemy's release switch to try and free your team. If the indicator is somewhere in the middle, the bots will stay closer to your base while fragging the other team. And lastly, if the indicator is on a low setting (low aggressiveness), the bots will stay near your release switch and defend it. You can adjust the aggressiveness from right inside the HUD. The default keys are: GrayPlus [+] to increase it, and GrayMinus [-] to decrease it. However, these functions can be assigned different keys inside the Jailbreak Preferences dialog. Also, something really cool about the bots in Jailbreak is that, when they're in jail, they sleep! They lay down and the whole bit. Don't fret though; when the release switch is hit they wake up instantly and leave the jail. Whenever a player from either team dies for any reason in a Jailbreak match they are sent to jail. The only ways out of prison are to be released by a teammate, get out through an escape route (if the map has one), fight for your freedom in the arena, or wait until the capture timeout runs out. If one of your teammates hits the enemy's release switch the doors of the prison you're in will open for a set amount of time and you can run out. Be hasty though, because if you take too long the doors will shut and you'll be stuck again. If the map contains an escape route then you can try to get through it and free yourself. Some escape routes require you to make human ladders to reach them. Some take away a lot of your health. The escape routes usually contain obstacles but they are all possible to get through. Also, once the capture timeout runs out (the set amount of time in which you must make a capture) all players from both teams are restarted in the map and the match continues. You lose all your weapons and pickups but keep your points. In this version of Jailbreak you can now take part in hammer fights in prison. Yes, you too can now splatter your teammates all over the prison walls with your piston. Players are respawned back into the prison as soon as they're killed and once the prison doors open everyone gets full health back. Also, if you're sent to the arena you'll receive full health. Prisons can be a variety of places, some of them being underwater, some being cages, others just being ordinary rooms. Whatever the case, try to avoid being killed and imprisoned at all costs. The arena is a fairly important part of each map prisoner. When you and at least one enemy player are in jail you have the opportunity of being sent to battle in the arena. The Jailbreak announcer will warn you just before your arena combat is to begin. While in the arena your only objective is to frag the enemy player. If you succeed you will be respawned back into the map and the loser will be sent back to jail. If you're killed, however, you will be sent back to jail and the winner will be respawned into the map. While in the arena there is a time limit in which you must fight. If the time limit is exceeded both combatants are sent back to jail. Players in prison can now watch the arena battle. You have the option of doing this or just sitting in jail. The key that toggles this option can be set in the Jailbreak Preferences dialog. Check out the screenshot below for a view of the arena cam while in jail. Once a whole team has been captured, they will be executed and the other team gets a point. How the captured team is dealt with is different in almost every map. In some maps, the team is simply gibbed. However, in other prison executions, the mapper may have included a custom death scenes for your pleasure. Like in JB-Phasma for example, four prison sliths (monsters) are released from cages in the jail, and they kill all the players. In JB-DarkTowers the floor drops away and the prisoners fall into a cavern where they are sucked through a giant fan which... well you can guess the rest. A cool new feature in this version of Jailbreak is a camera-like view of the team getting executed. Whenever an entire team is captured the player who fragged/captured the last person on the enemy team is shown taunting the captured team while they are executed. A unique message is also displayed in the bottom right hand corner of the screen telling about what the player did. Your view is automatically switched to this death camera whenever a team is captured. Check out the image below for one example of a capture screen. Release protection is an extremely handy feature of UT-Jailbreak. It's a server-side setting, but you can adjust it to your liking in a bot match. If it's active it will protect newly released prisoners with an invulnerable shield so that enemies who camp right outside the prison can't kill you as soon as you're released. When the shield is active you can hurt opponents but they cannot hurt you. Below is a picture of the release protection part of the Jailbreak Preferences dialog and an explanation of what each option does. First of all, you must select an option from the Release Protection box to activate release protection. If you select Invincible, prisoners who have just been released are protected with an invulnerable shield for a certain time or until they pick up a weapon. If you select Invincible/Llamaize, attackers who attempt to inflict damage on protected players beyond a certain damage threshold are llamaized in addition to that. The Time Limit specifies how many seconds the release protection is active. Remember, prisoner, you cannot hurt any opponent with the release protection active. The Taking a Weapon option specifies how many seconds the release protection remains active after a prisoner picks up a weapon. The Using a Weapon checkbox will, when checked, remove a player's release protection as soon as they fire a weapon. If it's not checked then the time settings will take effect. A player is considered a llama if they disconnect from a multiplayer game while in prison and reconnect in an attempt to cheat their way to freedom or if they try to kill a protected player. If this happens, that player will be designated a llama. Killing a llama scores the llama killer five bonus points. If, after a designated amount of time, a llama hasn't been killed, the llama simply explodes. Llamas can't release their teammates from prison or get chicks either. This version of Jailbreak sports a brand new llama effect, similar to being extremely drunk. :-) If you're a llama you'll see. In addition, you llamas will have a colorful glow around you to help other players hunt you down like the llama you are. Sudden death overtime occurs when the time limit is up and both teams are tied with the same number of captures. A text message will be shown warning you that overtime has taken effect. In overtime the capture timeout is disabled so if you're in jail you're there until your team releases you. The first team to score a capture in overtime automatically wins the match. Modify the aggressiveness of your team's bots. You can bind keys to these commands using the Controls tab in the Jailbreak Preferences dialog. Toggles the direction the compass points to (either red or blue release switch) and the scoreboard sort order. You can bind a key to this command using the Controls tab in the Jailbreak Preferences dialog. 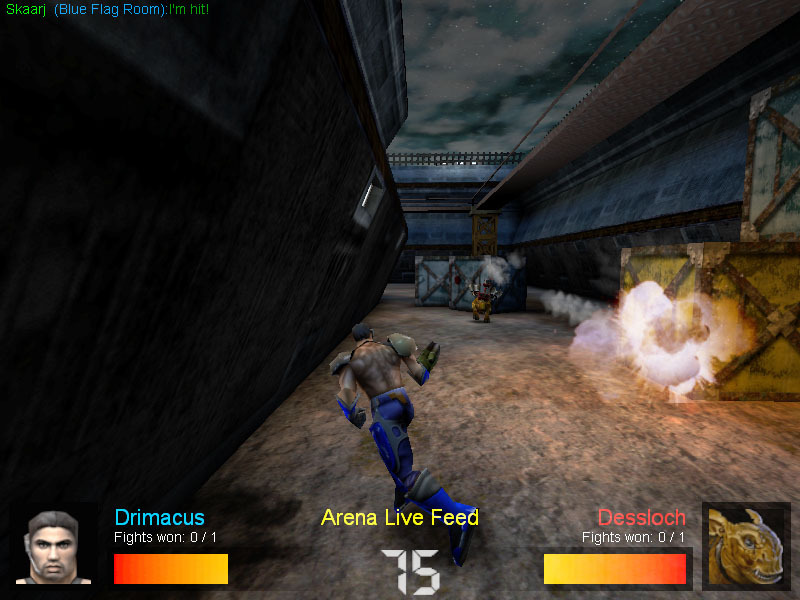 Toggles arena view mode when an arena fight is going on. You can bind a key to this command using the Controls tab in the Jailbreak Preferences dialog. Admin/botmatch only. Frees all players and starts the next round of the game as if the capture time limit had been hit. Admin/botmatch only. Makes the player whose name matches the given <playername> a llama. Use responsibly, commander, or your prisoners will get mad at you. Admin/botmatch only. Toggles supervisor mode; that means that you'll see all players' locations in your scoreboard (not just your own team's), and that you can switch to every player's viewpoint by pressing F5. Useful for map debugging and for finding campers. Admin/botmatch only. Writes information about players and bots in UnrealTournament.log. Use this command and save your UnrealTournament.log before reporting bugs to us; it provides valuable information that can help us fixing the bug you're reporting.